1951: Miss Evelyn Marshall learns a lesson, the hard way. 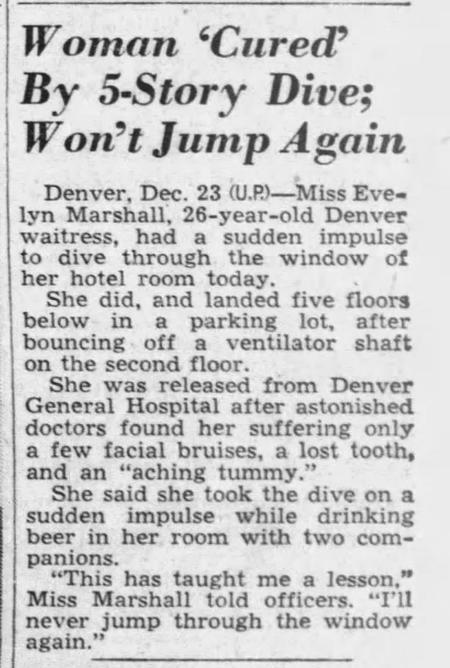 Denver, Dec. 23 (UP) — Miss Evelyn Marshall, 26-year-old Denver waitress, had a sudden impulse to dive through the window of her hotel room today. She did, and landed five floors below in a parking lot, after bouncing off a ventilator shaft on the second floor. She was released from Denver General Hospital after astonished doctors found her suffering only a few facial bruises, a lost tooth, and an "aching tummy." She said she took the dive on a sudden impulse while drinking beer in her room with two companions. "This has taught me a lesson," Miss Marshall told officers. "I'll never jump through the window again." Just drinking a little beer...un-hunh...right...wink, wink. That was my thought too. I wonder what the real motivation was. LSD, thought she could fly. That has happened before and it is easier to admit drinking than drugs. Who knows. Not LSD, I don't think, in 1951. It existed, but it wasn't used (that I know of) as a recreational drug by civilians yet. 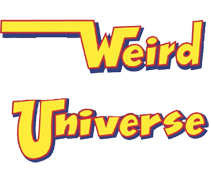 The US Army (maybe MK-Ultra?) had just started trying it out, and the recreational use developed from those programs. But other psychedelics were available - peyote, for one.